The good news is, we’re back on track with a bit of weight-loss. Victor is doing a bit better than me, but I’m not complaining. Anything in the negative bin is a win, as far as I’m concerned, and this isn’t a competition between us to see who can lose the most the fastest. We’re both down over 40 pounds since July. Not bad. Our trainer is coming up with new and innovative ways to cause us pain, so we’re both learning all about new muscle groups. Getting fit, anatomy lessons, pain relief… Fascinating stuff. When not killing ourselves at the gym, we’ve discovered a new TV show. At any given moment I’m about 5 years behind the rest of the world when it comes to TV, movies, and books, so while I had vaguely heard of The Great British Bake Off, I pretty much dismissed it as another Iron Chef-type show. I’m not a huge fan of cooking competitions, but The Great British Bake Off has proved to be the exception to the rule. We’ve seen two seasons, so far, and while we don’t always agree with the judges decisions, really like the premise of the show – fairly ordinary people with pretty good skills making things the best they can. The vast variety of things they have to master is incredible. And we have our favorite bakers from the two series we have seen – Richard Burr from Season 5 (1 in the US) and Kimberley Wilson from Season 4 (2 in the US.) Both were finalists, neither won the championship, but both are fun, talented, and real – and who would have won had I been the judge! I’m a baker, and I’m reasonably good – probably not top-notch competition good, but reasonably good – so it’s been fun watching, figuring out what I would be doing, marveling at the things they have come up with – and knowing that much of what the judges are asking for is nigh-on impossible in the time frame given. I can only imagine the stress. On the other hand, I have learned so much about where my own things go wrong and how I can make them better. I’ve been especially pleased with their bread baking and have picked up a few tricks to make sure they’re consistent. And I’ve also been reintroduced to being a bit more precise in things. I’ve gotten lazy in my old age – it’s time to tighten things up a bit – again. It’s really a good thing we didn’t find this show a few years ago – we would have needed to lose a hundred pounds or more. Besides the breads, I constantly see things I’d love to make – Chelsea Buns, Swiss Rolls, Cream Cakes… Rich, ooey-gooey masterpieces that have a very limited place in our current dietary regime. One thing that did intrigue me was hot water crust pastry. I have cooked flour in water and milk to make bread, but never to make a crust. I figured it was about time I did, so I headed off to Richard’s website to see if he had a recipe. 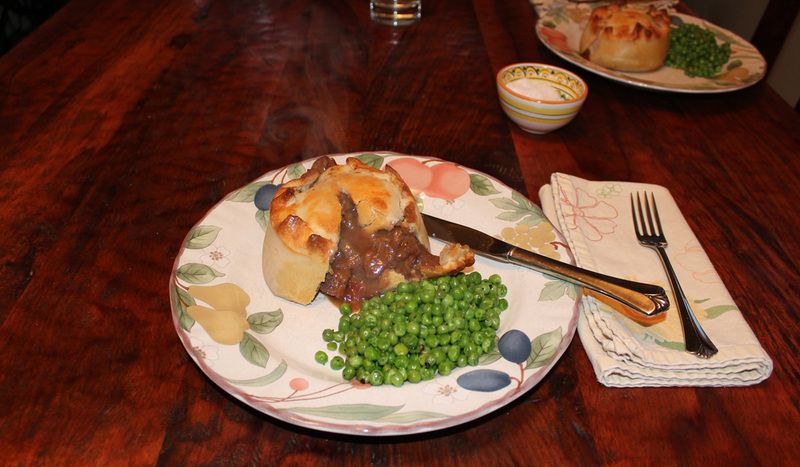 I found the perfect recipe for a Steak and Ale Pie – and went to work. Since there is just the two of us – Nonna won’t eat something like this – I started by halving his recipe. I then made individual pies because I had a feeling that if I just made one, we would eat the entire thing in one sitting. This forced us into portion control. I did the recipe exactly as written – including using Old Speckled Hen Ale as he did in his recipe. It was on the shelf at the local Wegmans – go figure. I merely adjusted the baking time which I probably shouldn’t have done. The crust wasn’t quite as crisp as I think it should have been. But in the grand scheme of things, it was excellent! The filling was really rich and flavorful – one of the best beef dishes I’ve had in a long time. It was really simple but with a ton of flavor. As I mentioned, I found the Old Speckled Hen Ale Richard used in his recipe and it had a ton of flavor, as well. It tasted like what a beer should taste like. 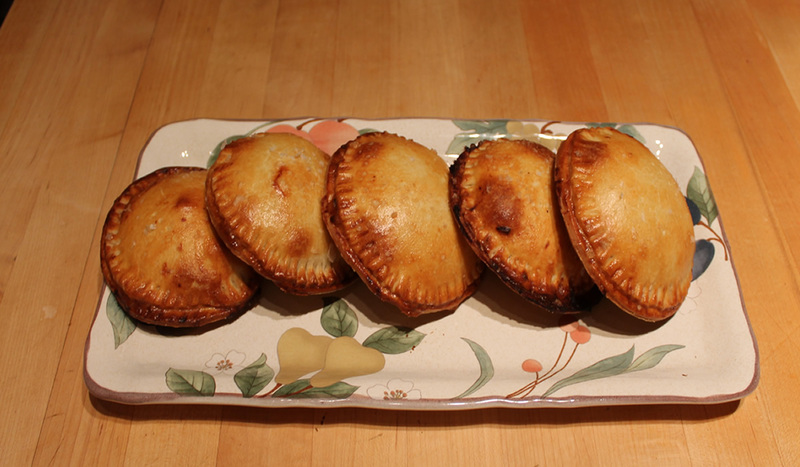 Since I had both dough and filling left over, I made a couple of little hand pies for lunches. We will be enjoying this meal for a few days! We’re going to start the next season of The Great British Bake Off tonight. I’m sure there will be more fun foods coming forth. Thanks, Richard, for a great recipe!